Each coral tile is unique and displays two of the five corals. The duplicated coral at the top of the coral tile denotes which of the two types of coral is the stronger. The single polyp at the bottom right of the coral tile can be consumed by the stronger coral. Corals of the stronger type can always defeat corals of the weaker type, irrespective of the size of the target coral. Each coral tile also shows two of the four types of algae; blue, green, purple or red, in the bottom left of the tile and may also show a third, smaller brown alga. (See 'Coral tiles' under Setup.) One colour of alga is shown larger in the foreground and the second colour behind and smaller. When a player exchanges a consumed polyp tile for an alga cylinder in action 7, they must then immediately play that alga cylinder. The options available for playing the alga cylinder depend on whether or not that player has already played a shrimp onto the open-sea board as a result of having eaten their first coral (see Parrotfish). place the alga cylinder on the top of one of the coral tiles. If a player has not yet played a shrimp onto the open-sea board then they must place the alga cylinder onto the alga cylinder space on the open-sea board. A player may exchange more than one consumed polyp tile for an alga cylinder in one turn, but they only place one of the alga cylinders onto the coral tiles per turn. Any other alga cylinders must be placed onto the alga cylinder space on the open-sea board. Example: The middle illustration shows the effects on the coral tiles in the top illustration, after a blue alga cylinder is played. The bottom illustration shows the subsequent effect of a red alga cylinder being played on the tile indicated. The numbers identify the coral tiles affected. If an alga cylinder is placed onto the alga cylinder space on the open-sea board, all of the coral tiles which display a large alga of the same colour as the alga cylinder just played and which do not already support an alga cylinder are flipped over. Any alga cylinder, which was already on the alga cylinder space, is removed and placed back with the other unused alga cylinders, where it is available for reuse later in the game. As mentioned above, there is no limit to the number of times a player may choose this option during their turn. If an alga cylinder is placed on the top of one of the coral tiles the alga cylinder selected must be the same colour as the large alga displayed on the bottom left of the coral tile. The coral tile selected must not already contain an alga cylinder. All of the remaining coral tiles which display the same colour of large alga as the alga cylinder just played and which do not already support an alga cylinder are then flipped over. As mentioned above, this option may only be chosen once per turn. On the reverse side of the coral tile, both the two coral colours and the two alga colours are reversed. The algae have 'energised' the previously weaker coral giving it additional strength. The smaller alga shown on the coral tile is for information purposes only. 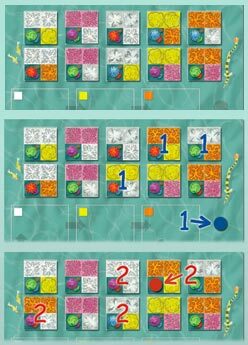 This information enables players to know which colour alga must be played in order to turn the coral tile back again once the tile has been flipped over. Hint: Placing the alga cylinders onto the coral tiles is a key part of winning the game. An alga cylinder locks the coral tile into that position for the remainder of the game. Each time a type of coral features on the top of the coral tile at the end of the game, the value of that coral is increased. It is therefore advantageous for a player to fix the coral tiles so that they increase the value of the polyp tiles that their own parrotfish is consuming. As mentioned, when a consumed polyp tile is exchanged for an alga cylinder, the alga cylinder must be played immediately. If it is not possible to play a particular colour of alga cylinder immediately then that colour of alga cylinder cannot be chosen.